Actress Kerry Washington speaks onstage during the 'Grey's Anatomy,' 'Scandal,' and 'How To Get Away With Murder' panel discussion at the ABC Entertainment portion of the 2015 Summer TCA Tour at The Beverly Hilton Hotel on August 4, 2015 in Beverly Hills, California. Kerry Washington looked gorgeous, as always, with her high-volume waves and side-swept bangs at the 2015 Summer TCA Tour. 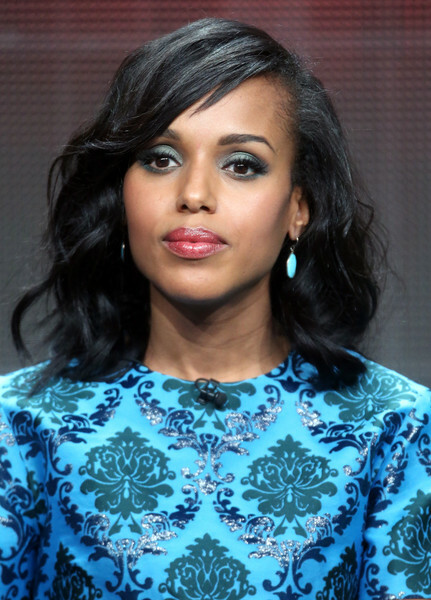 Kerry Washington swiped on some blue eyeshadow to match her earrings and outfit. Kerry Washington finished off her beauty look with a glossy red lip.